Growing up, home meant comfort dishes. Home meant hearty dishes. Home meant easy dishes. My mom, although not extremely comfortable in the kitchen, always made delicious meals with the simplest ingredients. Meals didn't have to be elaborate or take hours to make. Meals just were to be enjoyed with the family and that's one tradition I love is that we always ate dinner together as a family of four. Now, having a husband and toddler of my own, I like to take those traditions on myself, still keeping meals easy, hearty and make you feel cozy and comfortable eating them. With Ragu's Home Styles Pasta Sauces, it's a no brainier that to me, that I want my family to have the best and to leave feeling satisfied. These sauces are their thickest yet, their boldest flavor with special blends of herbs plus no artificial flavors, colors or high fructose corn syrup. It's the perfect sauce to add to an easy recipe like this one pot wonder I created using the Thick and Traditional sauce. My daughter and I are the biggest fans of Mac and Cheese. I'm also a huge fan of Chili as is my husband. 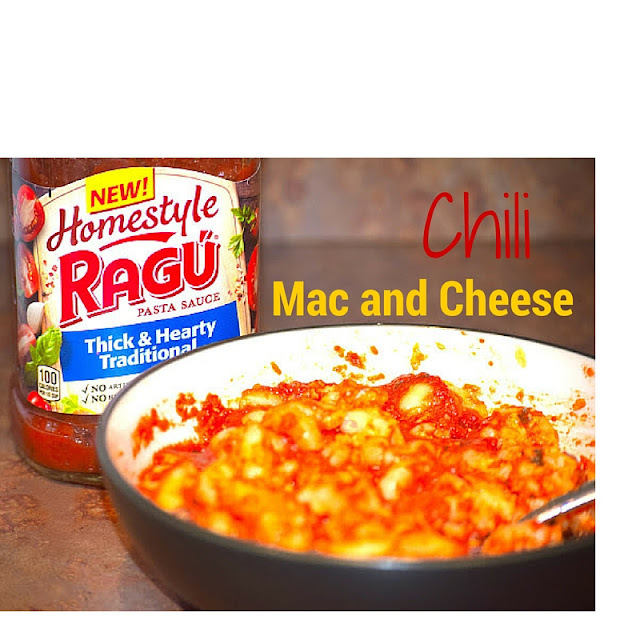 Why not combine these two love affairs into one delicious dish using Ragu's amazing sauces? 2. Stir in the sauce and bring to a boil over high heat. Reduce the heat to low and simmer covered for 7-10 minutes. 3. Stir in the macaroni and heat through until noodles are soft and tender ( 13-15 minutes ). Remove from heat and serve immediately. Top with cheese and sour cream (optional ). What are one of your favorite home styled dishes to make? What a gorgeous dish! Like you, our family always had homemade meals together when I was a kid, and I want to instill that family dinner time love in my toddler. There's something so great about being able to use RAGU to spice up your dish, and I love that you combined mac 'n cheese and chili. How could this NOT be delicious?! Sounds AWESOME!! Cant wait to give this a try! My hubby would love this! I need to give it a try! I love finding recipes that my boys can put together. They love helping me with dinner, and this looks like a winner! Thanks for sharing!